@lil-sea-salt The most important fact is that you've taken the first step! Thousands of others can't say the same. @Zaboem Yay!! I'm so glad it all cleared up! paper horn and confetti! @Littlemissno It's true what they say: the author is their work's biggest fan! I'm glad you feel ecstatic about your story! That passion will definitely feed into your readers. Well, the upload error is back. This time, the work around in not working. 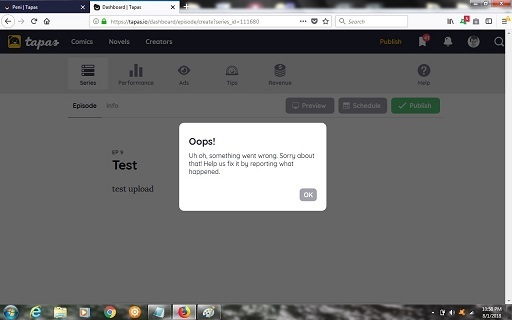 I can't even upload a on-sentence chapter that I originally typed into the webpages text block. Here's hoping that the problem clears itself up soon. For me, I thought that the writer's contest was a great way for the novel community to come together. There was a lot of good friendships made through the forums c: Also, the novel section became really really lively which is always a good thing! My only problem was the marketing Tapas has done There are only three days left and even though we are on the 'front page' (barely, for my computer the writers camp is only half, and on my phone you have to swipe to see it), it hasn't helped many of us. Most of the writers were expecting something big and exciting so it was quite a bummer. It's still morning in California, so the staff may have not even seen my email yet. I really expected more prominent marketing for the contest, I was super disappointed! This would have been a fantastic opportunity for writers with fewer followers to get a lot of attention if the Tapas team had put more effort into it. I didn't even realize there was a banner on the mobile app until somebody told me, because of how hidden away it is. I hope they do better with advertising the contest next time! Same! I remember hearing that they had promotions in store? Or something like that about the writers contest. I think that is what hyped everyone up for what was to come. Honestly, all the entries are really good so I don't see the downfall of giving a full ad TT but who knows. Maybe there is a reason? Yeah same, I only found out through a posting on a thread. It's quite a pity even we can't find it without help. Honestly, if they're doing a 3rd round, I hope they wait a while longer between camps than they did this time around. The Writer's Camp collection has never been well explained to the audience, and I wouldn't be surprised if a lot of readers didn't even click on it thinking it was the same stuff as before - if they spotted it at all. Contests need time to breathe or the audience is just going to get burnt out and uninterested. Same. I kept searching the tag until I think a few days ago? There was no promotion, and I don't think people even know what camp is. I wouldn't. When I was reading on just the app, I never clicked on banners, let alone swiped through them, and I didn't know about the forums until about a month after I signed up. Not everyone goes on here, so they won't know about it. As for contest time, I heard they were going to do it again during the summer, but it still seemed rushed to me like the last one. There should have been more time inbetween camps, like you said. Good luck to everyone! I hope you're all very proud of yourselves for what you've achieved. I sure am I had a lot of fun writing for this camp, compared to being stressed out the last one. I've met a lot of awesome people and received a lot of encouragement. My novel is fun to write/read, and I wouldn't have changed anything about this process (except maybe writing more, but oh well. Time got in the way towards the end.). I've read as many novels as I could, and I loved a lot of them. So, CHEERS! We've done a wonderful job making it this far, and I'm proud of you all. Agreed with @Littlemissno! Great job, everyone, for surviving July Writer's Camp! CON: Tapas does not do a fair job in advertising the writing community nor the novels, themselves. It is understandable, as Tapas first began as a comic website. However, favoritism is still perceivable. Not only is the community and the writing contest itself seemingly an afterthought, but novels are not given the opportunity to hold the spotlight on the front page. If this lack of commercial support continues, Tapas novelists may eventually lose interest in the website, which is unfortunate as online serialized novels are becoming the next big craze and I don't want Tapas to miss out. In short, Tapas, you're doing an excellent job bringing us all together! We just ask that you help our community reach that big next step. Again, great job, everyone! It wasn't easy, but we all did it--we brought our stories out there! Good luck in the competition, and God-speed! Weeeell, I thing that describing the situation as "not do a fair job in advertising" might be misstating things. The word "disappointing" fits better. It isn't unfair. I don't recall reading anywhere that Tapas was responsible for advertising our work. We are getting to post on the site for free after all. Your PRO description is 100% on point. it may not be their job to advertise our work individually, but the lackluster advertising for the writers camp as a whole was what a lot of people were disappointed by. They're hosting the camp for a reason, right? It's disappointing for the camp not reach the potential that it could if advertising for the camp was better done. @Zaboem and @jiemae Yes, you're both correct. We the creators are responsible for marketing our own work. That goes with the creative business in general. Tapas is providing a free service where we may post our stories, and it is expected of them to highlight the more popular stories that garnered awareness and income to their business. However, if they are to hold a writing competition, then their marketing for the writers as a whole is disappointing. Writer's Camp missed an otherwise untapped audience as the Camp was not given a prolonged spot on the front page. I may not have made myself clear in my post, and I will re-edit my comment for clarification. Thank you, you two, for a good discussion on the matter! And I'm sorry, Zaboem, that you ran into so many technical issues. That's a rough ride.